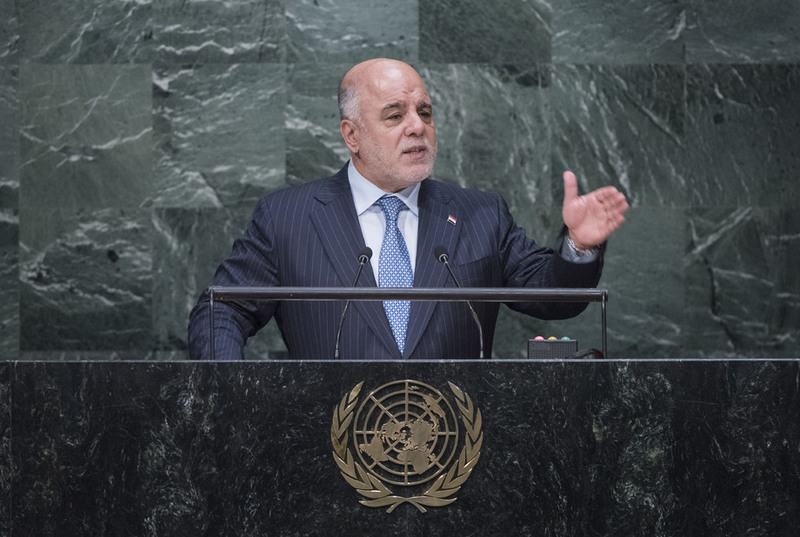 HAIDER AL ABADI, Prime Minister of Iraq, said that, in his country, the development level had dropped after a series of wars and due to the policies of Saddam Hussein’s dictatorial regime, the embargo and deprivation that accompanied international sanctions. After changing the political regime and creating a democratic environment throughout the country, and with the support of the United Nations and other international organizations, the development conditions had seen a relative improvement. The country had made remarkable progress in reducing mortality rates, raising the percentages of children in school, reducing the gender equality gap, and improving living standards. However, the “evil will” carried out by terrorist groups such as Al-Qaida and Da’esh and those that followed from the Ba’ath regime had hindered the development movement and spread murder and destruction. Today the people of north and west Iraq were either displaced or suffering in their cities and villages. While his country highly appreciated the support of the United Nations and the international community in its war — including the hard efforts to stabilize the liberated areas by Iraqi security forces — he looked forward to an active contribution by countries and organizations to help repair Iraq’s infrastructure and help aid its reconstruction. The country had produced a political, economic, administrative and financial package of reforms and had started to work on activating the private sector. It was also supporting small and medium-sized enterprises despite difficult financial conditions. Welcoming the adoption of the Sustainable Development Goals, he said the importance of that declaration was not limited to attaining further development for humankind. It would also promote a clean and safe environment, protect the rights of the next generation, spread peace and security, eliminate poverty and discrimination and improve health and educational standards. That agenda required the people of all countries to work hard, but also to provide the United Nations enough space for “constructive movement” to speed up the achievement of those targets. He expected all countries to adhere to and implement Security Council resolutions 2170 (2014), 2178 (2014), and 2199 (2015) on the prohibition of support, finance and arms for terrorist groups, in addition to the General Assembly resolution related to saving Iraqi heritage.